In the fall of 2014, Los Angeles Mayor Eric Garcetti held a press conference in front of the L.A. Department of Water and Power’s (DWP) downtown headquarters to sign his Executive Directive #5, titled “Emergency Drought Response – Creating a Water Wise City.” ED5, as everyone called the Directive, was meant to be the mayor’s big symbolic gesture signaling his seriousness about addressing the region’s ongoing drought crisis. His staff had invited several leaders of local environmental NGOs to stand by his side during its signing. As the assembled crowd of journalists and environmentalists looked on, Garcetti explained how, due to the past few years’ dismal precipitation, both in L.A. and across the region, the city had been forced to buy a higher-than-usual volume of imported supplies from the region’s largest water wholesaler, the Metropolitan Water District to meet demand. Expressing distaste for the expense and potential insecurity of this supply, Garcetti revealed one of the Directive’s three goals: a reduction in the DWP’s purchase of imported potable water by 50% by 2024. To make these cuts possible, he told the crowd, the city would rely on increased conservation and the use of new, locally sourced water supplies, such as stormwater and recycled wastewater. The NGO leaders applauded at these lines, as they were meant to. 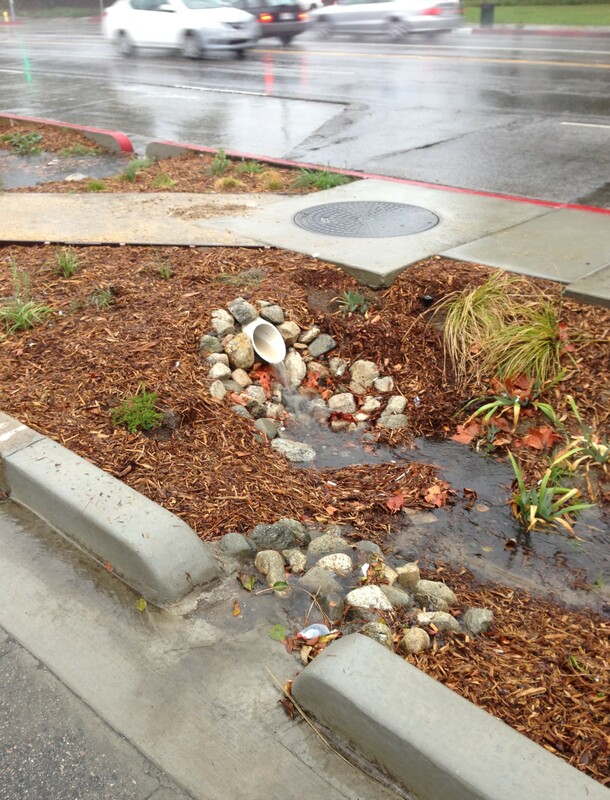 The importance of L.A. sourcing more of its water locally was already a common talking point among the environmentalists. Like Garcetti, they regularly railed against the cost of purchasing water from Metropolitan and the vagaries of relying on supplies to which L.A. lacks a primary claim. But the environmental leaders also raised other concerns about importing the resource, such as the impacts of the city’s water extractions on the hinterlands and the energy (and attendant carbon emissions) required to move water across great distances. Based on this combination of factors, in 2012 the University of California Los Angeles had gone so far as to make a “100% local” water supply by 2050 one of its sustainability “grand challenges” for the city. Imagining L.A. relying exclusively on in-city groundwater, captured rain, recycled wastewater, and reduced consumption to sustain its four million residents, the UCLA initiative was an articulation of a desire for a radically reworked urban metabolism. Yet even though the mayor’s target suggested an orientation aligned with the environmentalists’ goal, the details of the Directive and my observations among local water managers suggest a different vision of the future waterscape. “Localizing” L.A.’s water, in the eyes of those tasked with managing the resource in the region, is not understood as a project of eliminating all distant water sources from the city’s supply mix. The goal for this group is something a bit less dramatic, and a lot more consistent with past supply arrangements. Initially, while I found the paragraph’s reasoning clear, its first line struck me as puzzling. L.A. had been piping in more than 80% of its potable water from beyond its borders well before the drought began in 2011. 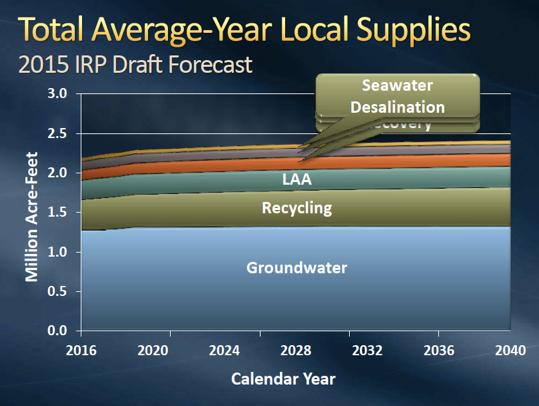 Groundwater and recycled water – the only “local” sources in the city’s supply mix, in spatial terms – had accounted for roughly 10% of the total since 2001. “Local” Supplies, per Metropolitan’s accounting – slide 34 from an August 2015 presentation on the agency’s Integrated Resource Plan. 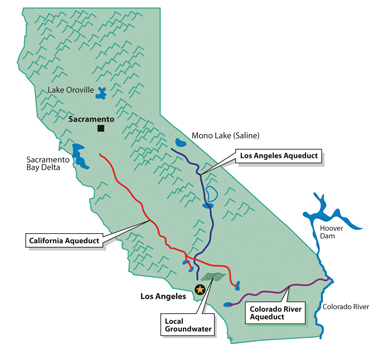 “LAA” refers to water from the Los Angeles Aqueduct. My encounters with DWP managers suggest that, for them, L.A. Aqueduct water is understood as a category of its own: not really local, but also not imported. In private conversations and public forums alike, they emphasized the agency’s longstanding claims to the water abstracted from those landscapes. “It’s a very high-quality water resource for the city,” a DWP representative explained to a crowd of environmental stakeholders listening to her presentation on the agency’s rates. “And we control it. So we’ll continue to use it as that percentage of our water mix.” The path dependency created by the existing infrastructure was also mentioned with some frequency. DWP representatives often cited the sunk cost of building the pipeline (as compared to the new costs of developing new infrastructure) as a justification for continuing to use that aqueduct and rely on water. For instance, at a public hearing in the Owens Valley, a questioner asked a DWP spokesman why the city was not investing in ocean desalination. “The thing about the aqueduct is that it’s already there,” the presenter replied, explaining that water produced through a desalting plant would cost far more than the flows from the Owens Valley, due in part to the construction costs for such a treatment plant. Choosing a different, more expensive source would be unfair to the public agency’s ratepayers, understood as its primary stakeholders. The agency’s commitment to continuing to source water through that pipeline is also reflected in the agency’s planning documents. 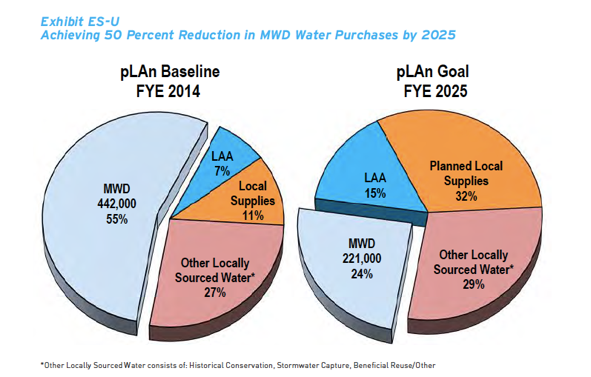 As the figure below indicates, the mayor’s Directive to reduce the city’s reliance on imported water should not be read to suggest a reduction in the supplies it draws from the L.A. Aqueduct system. In fact, the agency anticipates using more water from the system than it delivered in the drought year of 2014. Recent research carried out among ranchers and indigenous residents of the Owens Valley suggests that, if anything, the DWP has been (and intends to continue) guarding its water claims there even more closely than in past decades (Kirner 2017). Projected DWP supply breakdown in 2025, as compared to the 2014 figures, from the DWP’s 2016 UWMP, p. ES-25. Such projections suggest that, while the perceived desirability of water delivered to L.A. from other regions has fallen since the middle of the 20th century, the city’s water managers still foresee it playing a substantial role in the city’s supply mix in the years to come. When pushed, DWP employees always admit that, in the long term, they see both the use of L.A. Aqueduct water and the purchase of supplies from Metropolitan as inevitable. 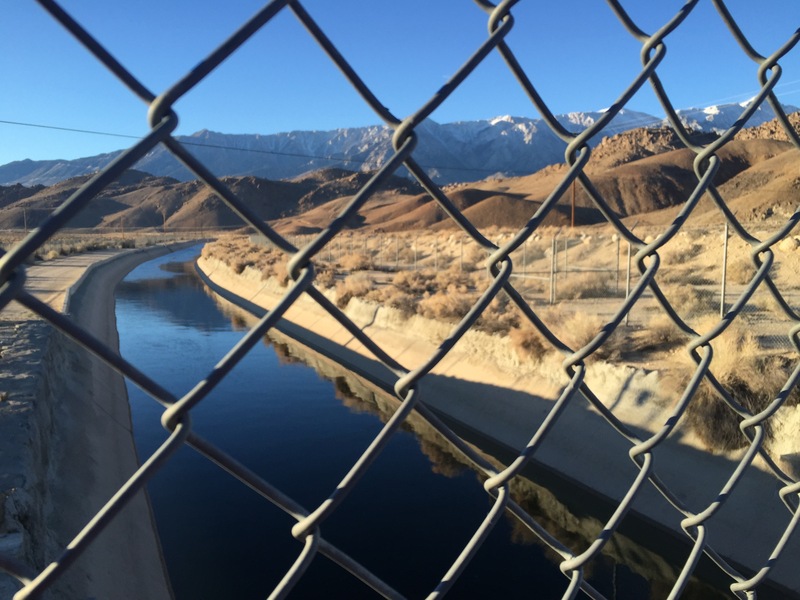 Hydrological variability might lead to radical reductions of flows from one source in a given year, as in 2015, when the combination of low snowpack and the requirements of a dust mitigation settlement in the Owens Valley led the agency to take almost no water from the L.A. Aqueduct system from May through November. But the governing assumption is that both supply options will remain accessible to the city, to protect L.A. from service disruption. In this conversation, like many others, the pair discussed the city’s water supply as a portfolio in need of diversity to protect users from risk. Relying too heavily on a single water source was described as a dangerous, insecure strategy. The parallels between this framing and the way that risk is understood within financial markets is hard to miss. Taking on a range of different risks is presented as safer than subjecting your entire investment to a single risk. Such economistic interpretations also echo those used in the development of multi-source electric “smart grids” (Ozden-Schilling 2015). This comparison helps clarify the role that these managers assume for locally produced water in the years to come. Capturing and storing this liquid as a reserve is not a project intended to eliminate use of the city’s hinterland resources. Instead, the water captured in the city’s subterranean basin is meant to serve as a reserve source, a buffer against both ecological and price variability in its other supplies. While critiques of “imported” water articulated by politicians and environmentalists might lead one to assume that L.A. is in the process of loosening its material ties to faraway landscapes, the more accurate way to see it is as the city is now establishing new resource links to its own landscape. Doing so, the city seeks to protect its consumer-facing delivery network from moments when the older bonds fray, continuing to provide customers with an uninterrupted flow of water. Current efforts to increase local water capture and storage are not a rejection of an arrangement in which the demands of the urban centers shape peripheral landscapes through extraction. Those material connections are becoming visible and questioned in new ways, in marked contrast to the ways in which they have been ideologically and discursively obscured in the past (e.g. Cronon 1991, Piper 2006, Needham 2014, Powell 2018). As such, here we should understand the efforts to supply local water as one of source addition for the sake of security, rather than of replacement for the sake of independence. Across Southern California, people use the terms “MET,” “MWD,” and “Metropolitan” interchangeably to refer to the District – sometimes using more than one of these terms within a single sentence. To minimize the use of confusing acronyms, I will refer to the agency as “Metropolitan” throughout. In some places, however, I will quote people using the other nicknames. Cronon, William. 1991. Nature’s Metropolis: Chicago and the Great West. New York: W.W. Norton. Kirner, Kimberly. 2017. “Water as Commodity, Water as Life: Conflict over the Value of Water and Its Management.” Conference presentation. March 30, 2017. Santa Fe, NM: Annual Meeting of the Society for Applied Anthropology. Needham, Andrew. 2014. Power Lines: Phoenix and Making of the Modern Southwest. Oxford, UK and Princeton, NJ: Princeton University Press. Piper, Karen. 2006. Left in the Dust: How Race and Politics Created a Human and Environmental Tragedy in L.A. New York: MacMillan. Powell, Dana. 2018. Landscapes of Power: Politics of Energy in the Navajo Nation. Durham: Duke University Press. Ozden-Schilling, Canay. 2015. “Economy Electric.” Cultural Anthropology 30(4): 578-588. Sayd Randle is an anthropologist and a postdoc with the University of Southern California’s Society of Fellows in the Humanities. She studies urban climate adaptation efforts and environmental politics in the U.S. West.